Katina refers to the offering of a special robe (katina civara) carefully prepared by pious laity and presented by them to monks who have completed the three-month period of retreat called Vas in Sinhala and Vassana in Pali (literally, ‘the period of rain’). 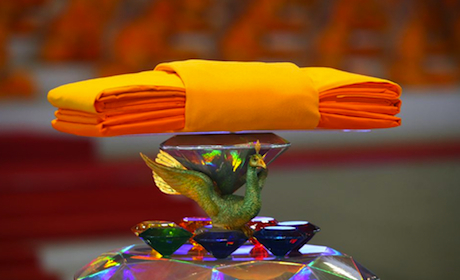 Katina literally means ‘firm’ or ‘solid,’ as the offering of a Katina robe helps one to earn good, solid karma. The Katina Ceremony has a history spanning more than 2500 years. 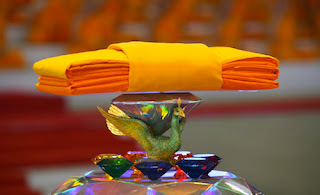 A special element of the Katina robe offering is that it is not offered to an individual monk, but to the entire community of Sangha; to all noble disciples of the Buddha -- and not only to enlightened ones, but also to those monks yet to be enlightened. The Katina robe can be offered only during a specified period at the end of the rains retreat, between the full-moon day of October and the full-moon day of November. It is a monastic tradition long preserved and observed by Buddhists all over the world, and is highly revered as a unique, once-yearly opportunity to acquire merit. 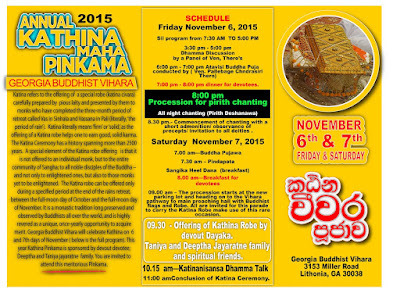 Georgia Buddhist Vihara will celebrate Kathina on 6 and 7th days of November (below is the full program). 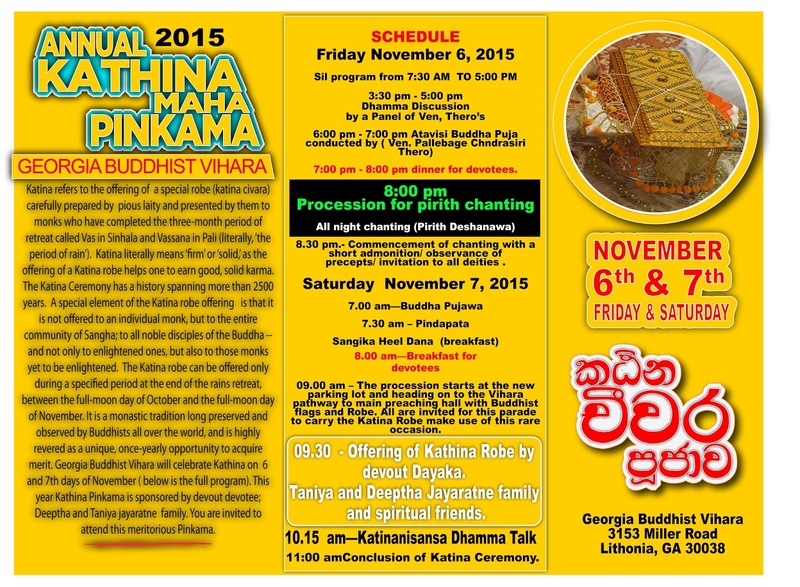 This year Kathina Pinkama is sponsored by devout devotee; Deeptha and Taniya jayaratne family. You are invited to attend this meritorious Pinkama. · Commencement of chanting with a short admonition/ observance of precepts/ invitation to all deities. The procession starts at the new parking lot and heading on to the Vihara pathway to main preaching hall with Buddhist flags and Robe. All are invited for this parade to carry the Katina Robe make use of this rare occasion. Offering of Kathina Robe by devout Dayaka. Taniya and Deeptha Jayaratne family and spiritual friends. 11:00 amConclusion of Katina Ceremony. බලන් සබඳ ඒ මුණි තෙද අසිරිය..